So where will you be on the evening of October 12th? Here are your cinematic choices, First Man or Gosnell: The Trial Of America's Biggest Serial Killer. Both open on the same day. We would like to propose you come to the Gosnell movie (and not just because we produced it). Both movies are based on true stories but only one has chosen to exclude details that don’t fit the politics of the director and cast - who seemed to be embarrassed by American heroes and their achievements. First Man tells the life story of Neil Armstrong, the first man to walk on the moon. It's a big budget, star studded movie - $70m buys a lot of star power. It has Oscar winning Ryan Gosling in the title role and Oscar winner Damien Chazelle directs. Multi-award winning Claire Foy plays Armstrong's wife. Until recently we were understandably nervous that First Man opens the same night as Gosnell: The Trail Of America's Biggest Serial Killer. But then we found out what was in and what wasn’t in the movie. First Man premiered in Venice and the mainstream media reviewers could not have loved it more. Then, it was revealed that a movie about the first landing on the moon had intentionally excluded the iconic scene where Armstrong planted the American flag on that same moon. He went on to say “...I don't think that Neil viewed himself as an American hero. From my interviews with his family and people that knew him, it was quite the opposite." Thanks for that insight Ryan and maybe it’s even true. But regardless of their opinions of Armstrong’s alleged feelings the astronaut was an American hero to people all over the country who watched in awe as he planted the American flag on the moon during the middle of the hottest part of the Cold War. Hollywood may not want to admit it now but the achievement was all American and Americans knew it then and know it now. The flag omission controversy forced director Chazelle to release a statement on Friday explaining why he “chose not to focus” on that iconic, inspirational moment that captured the imagination of the nation. “To address the question of whether this was a political statement, the answer is no. 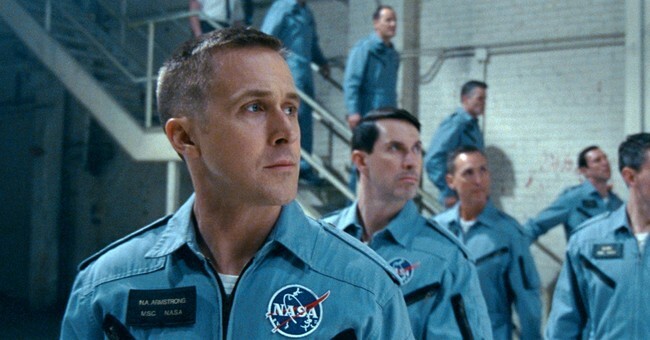 My goal with this movie was to share with audiences the unseen, unknown aspects of America’s mission to the moon–particularly Neil Armstrong’s personal saga and what he may have been thinking and feeling during those famous few hours,” Chazelle added. His claim that it’s not political might be believable if Chazelle was not so stridently political in every other aspect of his pubic life. And here’s a shocker, this mainstream Hollywood director is not a conservative. When he joined Twitter last year he immediately called President Trump a Nazi and white supremacist. And that's not all; Chazelle is also a cheerleader for Black Lives Matter and Planned Parenthood. How pathetic and ignorant. Black children are ripped apart limb by limb everyday by Planned Parenthood and then their limbs, brains, skin, livers, hearts, are sold to the highest bidder. It’s a tragedy that those black lives don't matter at all to Damien Chazelle. Our Gosnell Movie, starring Dean Cain and directed by Nick Searcy, is also about an iconic American. Gosnell is America’s most prolific serial killer but because he murdered during abortions the mainstream media refused to cover the investigation and trial. He was allowed to kill because establishment America chose to look the other way. But because we don’t believe in rewriting history we will be revealing what happened regardless of which political community upsets. In fact the only politician criticized by name in the Gosnell Movie is Republican Governor Tom Ridge who ordered state employees to ignore the law and not inspect abortion clinics even as the body count piled up. There are American heroes in the movie - the investigators who battled against a political and media establishment to ensure that Gosnell was convicted. They are also iconic Americans. These two movies open on October 12th. On that day you can support Hollywood’s anti-American lies and omission or support a movie that tells the truth. Which will you choose?